Well, I finally managed to transfer all my files from the old computer to the new one! Yes, there was quiet a few files to move, especially files relating to the blog. You'd be surprised how much you accumulate in three years of blogging! 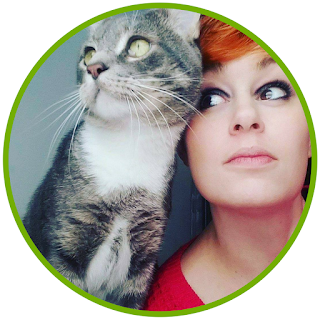 I figured what better way to come back than with a subscription box review! Everyone loves subscription boxes. This time I decided to try out the Moon Box by Gaia Collective. 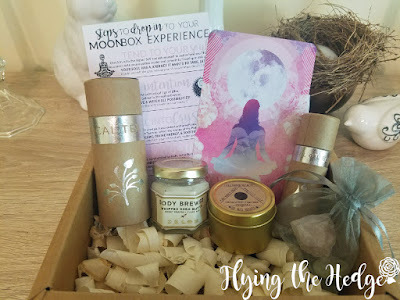 It costs $30 a month and comes with 3 handpicked crystals, dried herbs or tea, an essential oil blend, a moon oracle card, a featured artist item, and ritual supplies. It is similar to the Box of Shadows, which I really enjoyed. 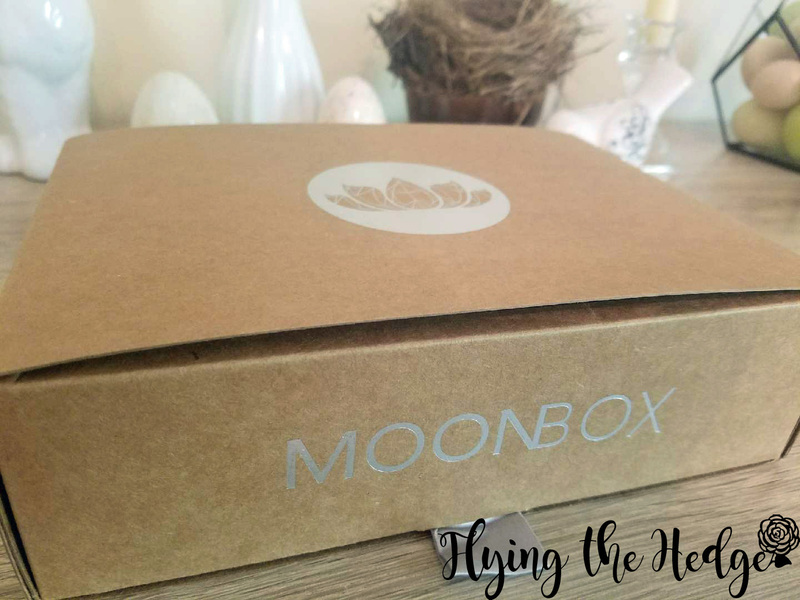 Furthermore, for every Moon Box purchased, they make a donation to Trees for the Future, a nonprofit organization dedicated to revitalizing degraded lands through educational programs for farmers and planting trees to create new forests around the world. 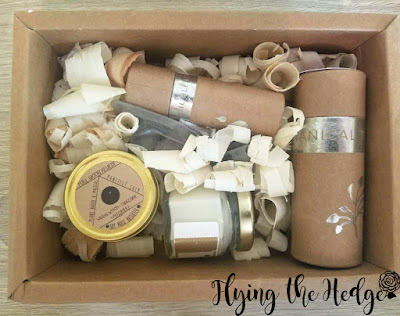 The box and packing supplies are environmentally friendly, so when you are done, it can be reused, recycled, or returned to the earth. April's box came with some delightful surprises. 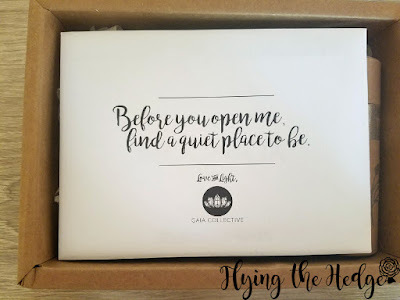 Upon opening is a letter that says, "Before you open me, find a quiet place to be." I settled down at my altar, shut the door, and opened a window to let the music of the birds outside bring peace and harmony to my room. 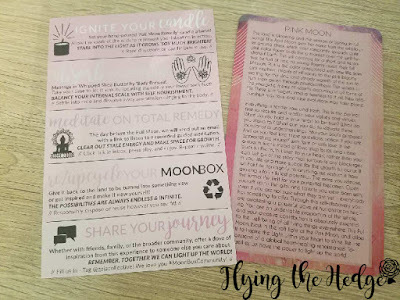 The envelop contained a card on how to use the box, a Pink Moon oracle card, a crystal information card, and a little booklet about Moon Box and Gaia Collective. 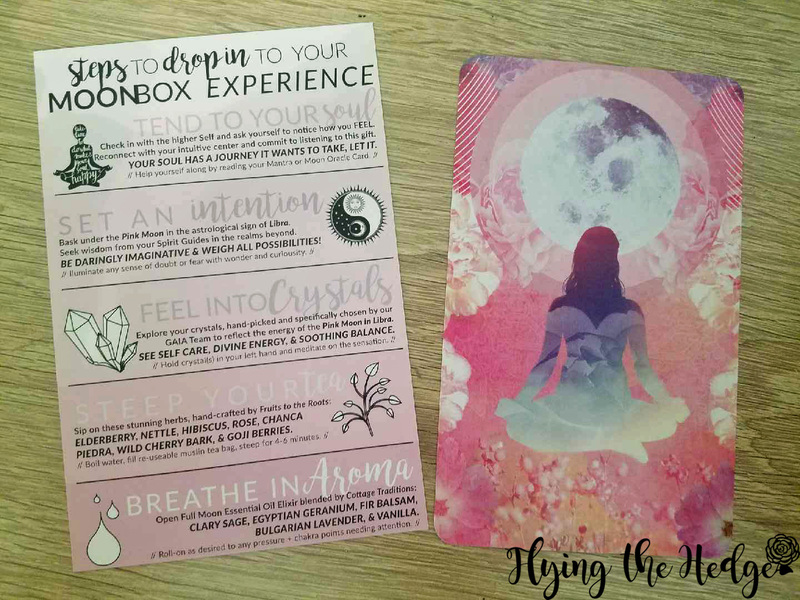 The oracle card spoke of spring and new beginnings, saying to listen to your heart instead of your ego. It encouraged to reclaim and reaffirm your values and virtues, and take a step back to recenter if need be. Underneath the envelope was some beautifully and sustainability packaged goodies! The first items I pulled out were the crystals. The little bag contained rose quartz, 3 Kyanite wands, and moonstone. 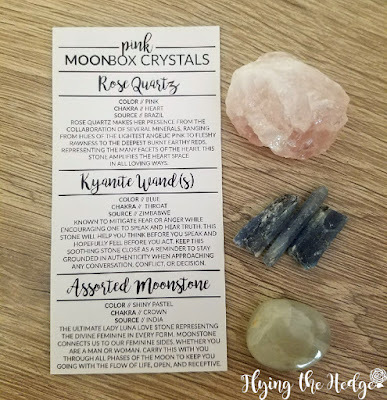 I adore moonstone, and was thrilled to add it to my collection. Per the instructions, I decided to meditate on these crystals. I placed them in my left hand, closed my eyes, and let them speak to me. First was the moon stone. It glowed gold and spoke of balance and peace, especially between work and personal life. It told me to stop worrying about the work I have to do, and spend additional time doing when I love, specifically in regards to my spiritual path. Next was the rose quartz. It was cool to the touch and spoke of self-love as it glowed bright pink. It let me know I needed to seek balance in my life and stop putting my love of others before the love of myself. It told me to hold my head high, even when faced with opposition. It spoke of not letting others, specifically my significant other, rule my emotions and view of my self-worth. Finally was the kyanite wands. They were hot to the touch, almost burning. They glowed dark red then purple. They spoke of power, specifically power over my fear and doubts. They encouraged me to put those aside and go forth with confidence, both in my personal and spiritual life. They also spoke of power in my relationship, telling me that I am strong enough to walk alone and not to fear loneliness. They also spoke of balance is speech and emotion, to listen more and control my emotions, specifically sadness, fear, and doubt. I guess it is time for some change. The kyanite was very clear in its intentions. I will be sure to carry them with me for the next couple of weeks to see how they aid me. I've never had a crystal feel so hot to the touch before. They all affirmed what the oracle card stated I should do this month: reaffirm and reclaim my values of strength, perseverance, love, and courage; to stop letting others rule my actions and emotions. Next I opened and steeped the tea which was hand-crafted by Fruits of the Roots. 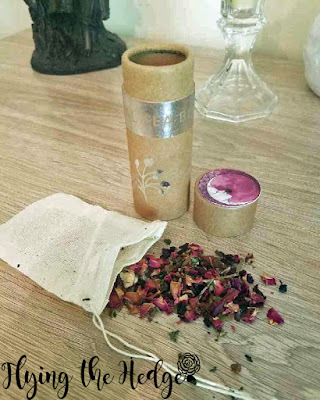 This blend contains elderberry, nettle, hibiscus, rose, Chanca Piedra, wild cherry bark, and Goji berries and comes with a re-usable muslin tea bag. I am allergic to Goji berries, but it appeared there were only 2 in the tea which is not enough to bring on a reaction. 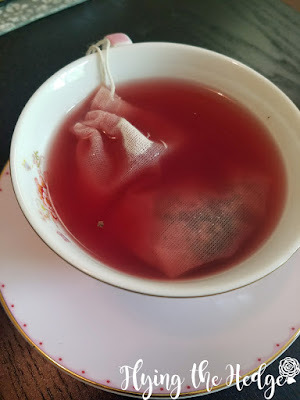 The tea brewed into a brilliantly pink hue, sticking with the theme of the Pink Moon. It smells of and tastes of roses. The flowers lend a delightful sweet undertone without the need of added sweetener. 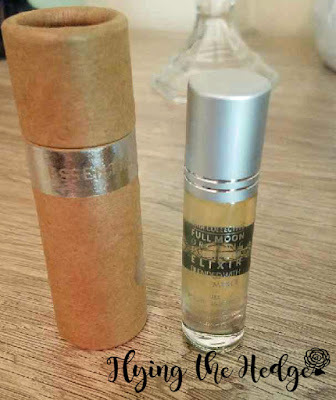 I then opened the Full Moon Essential Oil Elixir blended by Cottage Traditions. It contains Clary sage, Egyptian geranium, fir balsam, Bulgarian lavender, and vanilla. I spread some on my wrists and and breathed in the aroma. It is relaxing and reaffirming with the smell of vanilla uniting all of the scents. Next up was the candle. The candled is a hand-poured candle from Soy Much Brighter. 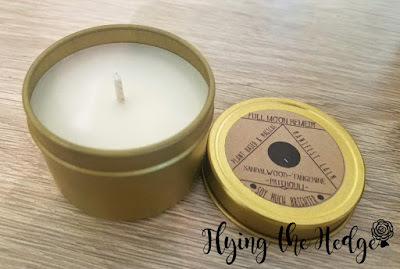 It is called 'Full Moon Remedy' and has a very subtle scent of sandalwood, tangerine, and patchouli. I struck a match and lit it, igniting my intentions to follow the advice of the crystals. I stared into the flame and imagined my intentions coming to fruition. 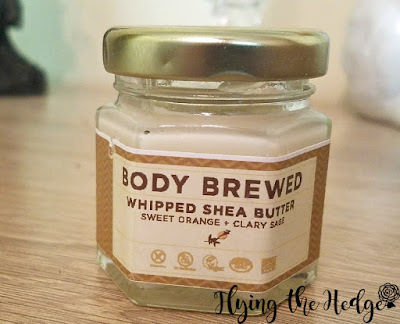 Finally I opened the Whipped Shea Butter by Body Brewed. It has a very subtle sweet orange and Clary sage scent, and is delicately thick. I rubbed some on my feet in an act of self-love and care. 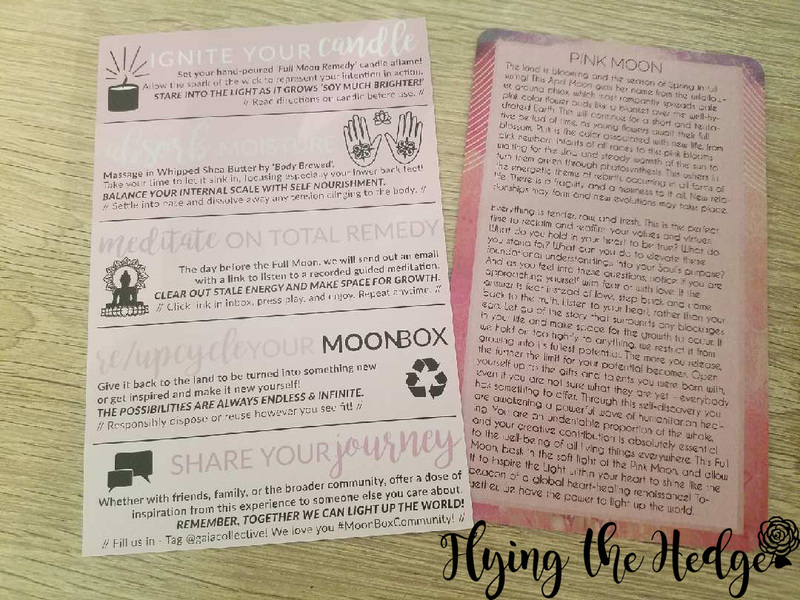 It absorbed quickly and left my feet feeling refreshed and moisturized. They have been aching all week from running and long days on my feet, so it felt wonderful to spend some time rubbing them and thanking them for carrying me through the week. 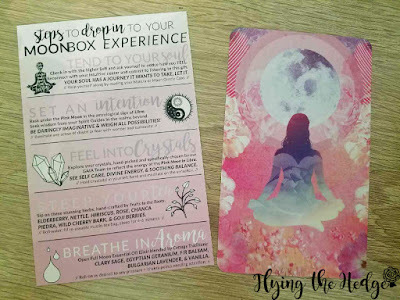 I ended my box opening ritual with a short meditation. I imagined myself walking through a old forest. I could smell the moss and damp earth and feel it between my bare feet. As I walked I begin to hear water and suddenly arrived at a clear, deep blue lake. I felt the sudden urge to swim and entered the cold water. I lay floating on my back, staring at the sky for some time before diving deep beneath the surface to explore the depths below. When I came up for air I felt refreshed and renewed. I walked to the shore and patted myself off with a towel sitting on a new by rock. I heard a twig crack and looked up to see a white stag standing across the lake from me. As I looked into its eyes I felt a sense of peace and strength and suddenly the meditation was over. I really look forward to the box that will arrive in May. Unlike the Box of Shadows, this box has an opening ritual which I found divine. The day before the full moon they send out a a recording guided meditation for the full moon. Unfortunately I missed it this time, but look forward to participating next month. Thank you! It was so good too. I hate to waste tea!